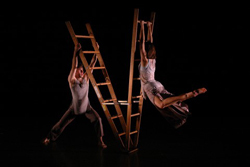 In Back to the Wall, dancers face the wall as an opportunity as opposed to an obstacle and mount the wall in interesting ways, with no harnesses or apparatuses – just strong physical partnering. On Taking Steps to Climbing Mountains uses five ladders of graduated-sizes to create windows, doors, and pathways, creating a world in which we would want to participate. Webmasters uses Internet connections to pair dancers in two distinct locations together, both physically/virtually via image projection. The dancers explore the wondrous, winsome, lose-some, whirling web of relationships. Love Strings is another version of Webmasters made for the proscenium-stage without the use of Skype. *Plus travel, per diem, and lodging. Price ranges accounts for difference in rep (sets).